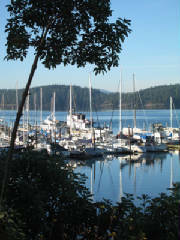 If your idea of the perfect summer vacation is a cottage home on the water, Orcas Island may be your spot. A visit to Orcas Island, Washington, starts with an hour-and-a-half ferry ride leaving from the mainland about an hour north of Seattle, and moving through the mist-shrouded mountains and inlets of the San Juan Islands. This leisurely crossing makes it easy to slow down and let worries slip away in the ferry's wake. By the time the island appears out of the clouds, with the picturesque villages tucked in between its evergreen-covered hills and golden valleys, the visit can begin to feel a little other-worldly. Though Orcas Island is the largest of the San Juan Islands, it is only 58 square miles, which includes the lush, 5,200-acre Moran State Park. Except for the park's 2,400-foot Mt. Constitution and its 360-degree vista of the area, nothing on this island is big. 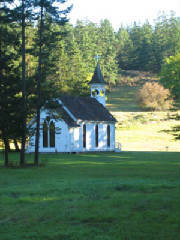 That includes the structures, which are mostly small and nestled into the landscape. But each is unique, with its own look and flavor, thanks to the many artists, musicians, and outdoor enthusiasts who make the island home. 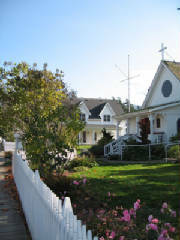 This is true of the inns and bed-and-breakfasts, like Rosario Resort and Spa, Turtleback Farm Inn, and the Orcas Hotel; the many individual cottages and cabins for rent; the restaurants; and the businesses that dot the island. 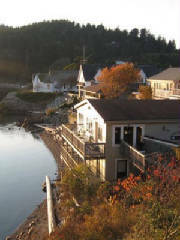 Eastsound, the largest of the several villages on the island, has a range of accommodations and restaurants. The Kitchen offers quick and delicious Asian food you can eat on picnic tables outside when the weather is nice, and Rose's Bakery and Cafe provides in-house baked goods and gourmet lunches. The Inn at Ship Bay is pricier but worth it, offering local seafood like oysters that taste as if they were plucked from the ocean just minutes before. There's an intriguing selection for the shopper, including a variety of local arts and crafts, books and clothing (both used and new), outdoor equipment, and items that are downright funky. 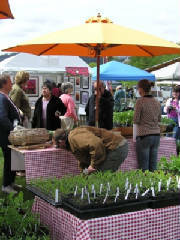 The summer farmer's market is a splash of colors and smells, with all types of local produce, flowers, and homemade foods available on Saturdays from May to September. Cottage businesses thrive on Orcas Island, particularly its pottery, like Orcas Island Pottery, Crow Valley Pottery, and Olga Pottery. But there are other art galleries, too, plus community theaters, photography studios, and many opportunities to hear music, such as the island's Woodsong Festival, and its annual summer Chamber Music Festival ("classical music with a view"). 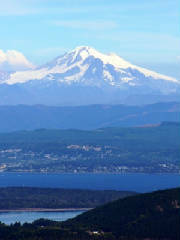 Probably Orcas Island's biggest draw is the scenery, including the wildlife and outdoor recreation that goes with it. Because the surrounding land masses protect these islands from much of the harsh weather other areas of the Northwest experience, the climate here is moderate year round. People can enjoy hiking, horseback riding, kayaking, bicycling, golfing, and swimming (at least those who like cold mountain lakes). Tours take visitors whale-watching out on the ocean and kayaking through the coves, and seeing wildlife like birds, otters, and deer is common. Standing on Orcas Island's tree-lined coast watching a bald eagle fly in over the ocean with a spectacular crimson sunset behind him can feel a little like being in another world, one that may be exceedingly hard to leave. Contributed by Liz McGeachy, a writer and musician living in Norris, Tennessee. This past summer Liz traveled to the Pacific Northwest with her family. She has agreed to share with our viewers her impressions of Orcas Island and other places they visited. When not packed in the van with their two kids, Liz and her husband, Tim Marema, perform traditional and folk music as Liz & Tim. For more information, visit their website at www.lizandtim.org.